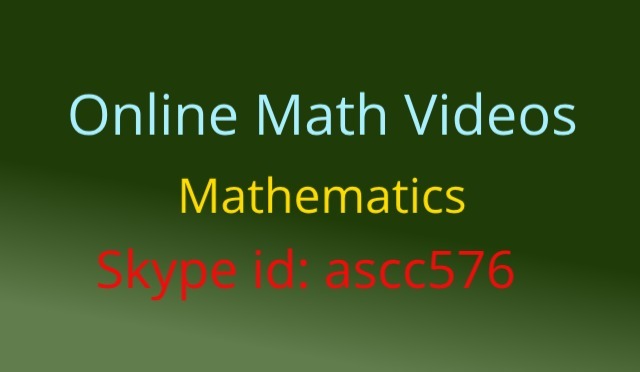 Online Math Videos - Online Tutor Pakistan, Online Tuition Karachi Pakistan, +92332-3343253 Skype id: ascc576, Online tuition Tutors Pakistan, Saudi Arabia ,Online Tutor Academy Pakistan Qatar, Kuwait, Saudi Arabia, USA, UK, Canada, Australia, Karachi Lahore Islamabad, Online Maths Physics Stats Tutor Karachi Pakistan, Online Tuition Pakistan,Online Tuition Pakistan, Online tuition in Karachi, Pakistani tutors, online tutors in Pakistan, Karachi tutoring, Online tutoring, Online math tutor Pakistan, Online Physics Tutor Pakistan, Online Teacher Pakistan, Online Chemistry Tutor Pakistan, Online Biology Tutor Pakistan, Online Economics Tutor Pakistan, Online tutor Accounts Pakistan. online Math Videos, Al-Saudia Virtual Academy, Online tuition Pakistan the largest online tutoring platform. Provides online classes, free online math videos, physics, chemistry, biology, statistics. Additional Free Math help by videos and free online worksheets. For the last three decades of teaching mathematics, I feel that students needs additional support other than their class work. Therefore I started recording of my lectures on simple videos not large enough, created them bit by bit so that it can be easier for my students to watch them and do practice accordingly. In the first step I’m going to launch mathematics videos, these will cover different topics related to Algebra, Geometry, Calculus, Statistics. Especially probability, sets, integration, differentiation etc. In addition to these will also upload videos related to Physics, chemistry, biology etc.